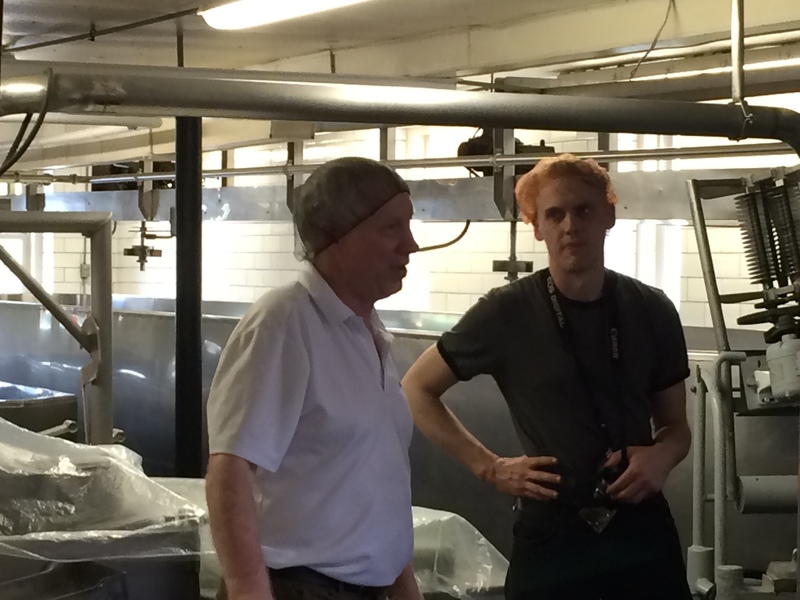 Learning about curds and whey. And enjoyed the cheese of Wisconsin, USA. 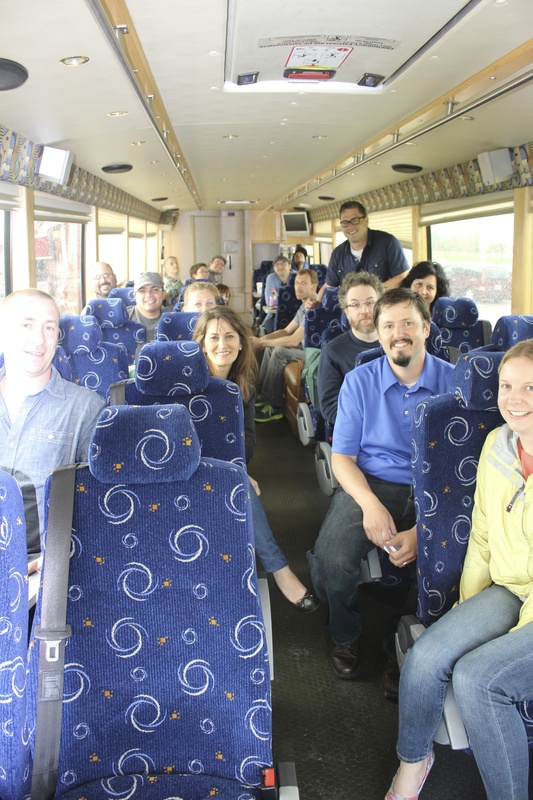 This past week Fortune Fish & Gourmet invited me to join them with some of Chicago’s finest chefs and cheese mongers on a 3 day Wisconsin Dairy Industry Tour. 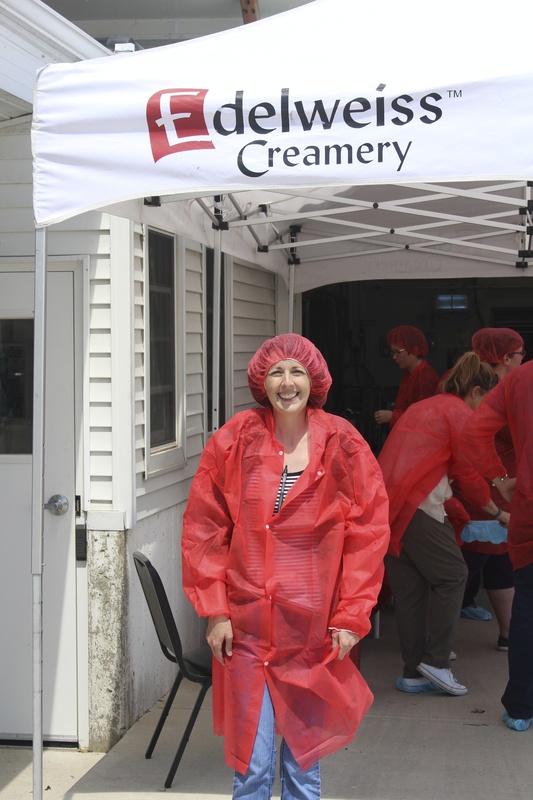 The great folks at the Wisconsin Milk Marketing Board did an amazing job organizing the trip. One of the biggest things I learned was discovering that the production side of cheese making actually made cheese EATING more exciting. (Is that possible??) 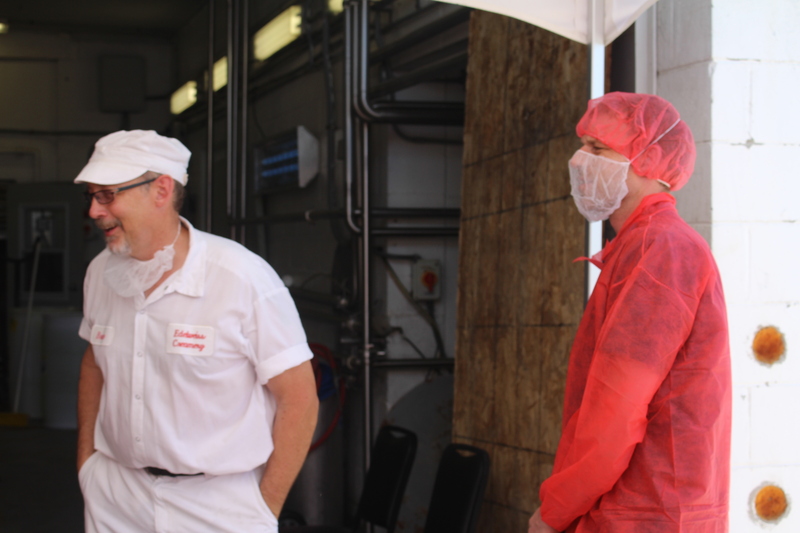 So today’s post will be dedicated to the art of cheese making and Monday’s post will be all about the cheese I ate. 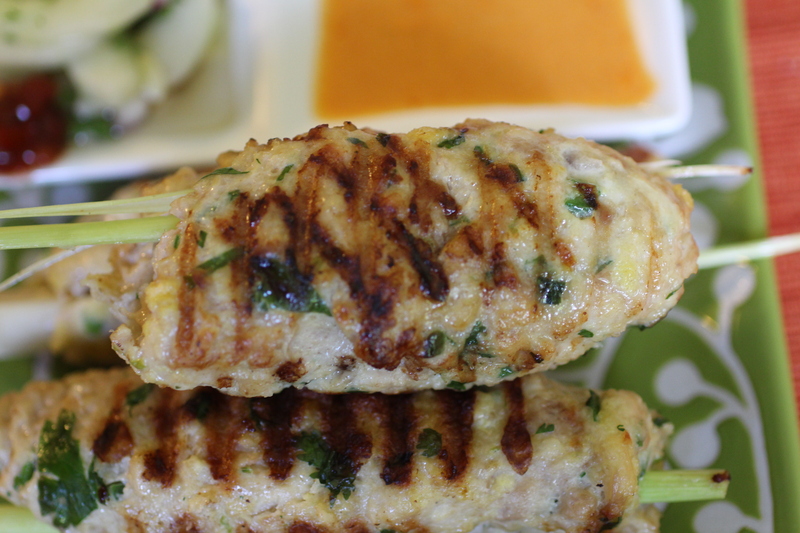 What is the first thing you need to make cheese? All cheese is made from milk. So you need a farmer to raise the cows or goats or sheep or even water buffalo. Think of the farmer as the milk harvester. Thank you, Sassy Cow for letting me love on your babies. 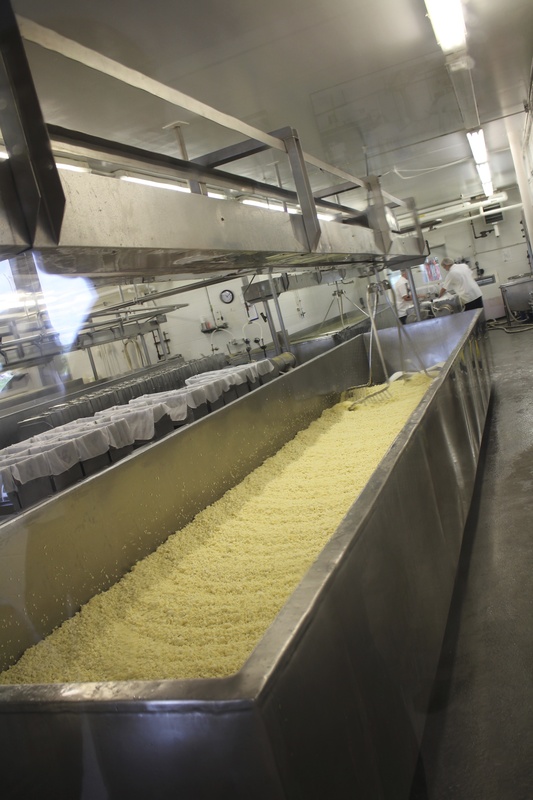 After the milk is harvested, it will go through a series of actions to produce its own unique variety of cheese. Did you know that it takes around 10 pounds of milk to get 1 pound of cheese?? Depending on the cheese, the protein to fat ratio has a specific target number so that a quality cheese can be achieved. This is all part of the milk intake into the creamery. Thank you Edelweiss for the great tour! Wrapped and read for the tour! 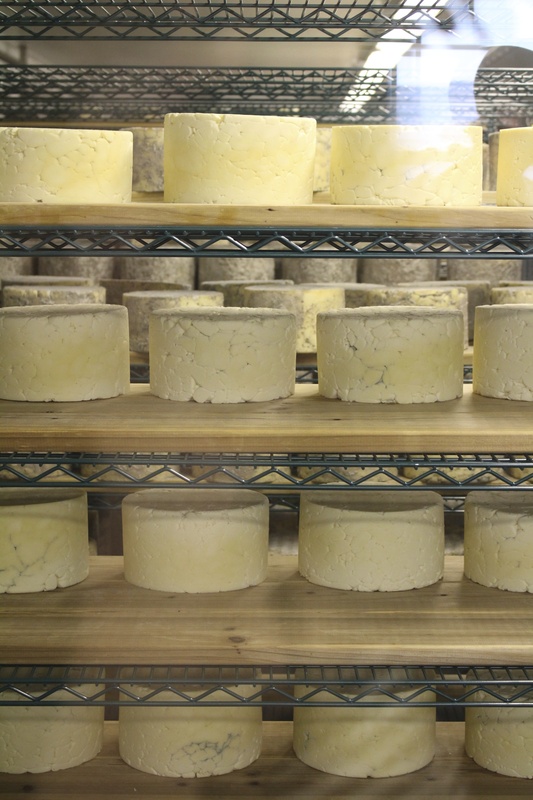 Raw milk cheeses are NOT pasteurized but milk for other cheeses ARE heat-treated and then cooled a bit. Pasteurized milk HAS to be cooled a little bit after pasteurization because cheese is made with a starter culture (or a good bacteria). Hook’s makes over 30 types of cheese! 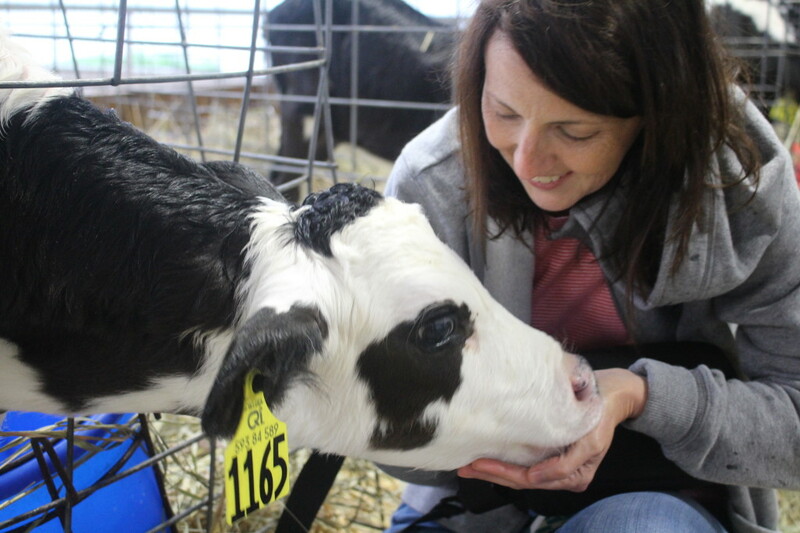 The different cultures that are added to the milk are part of the determining factor that helps give your cheese flavor and a specific texture. 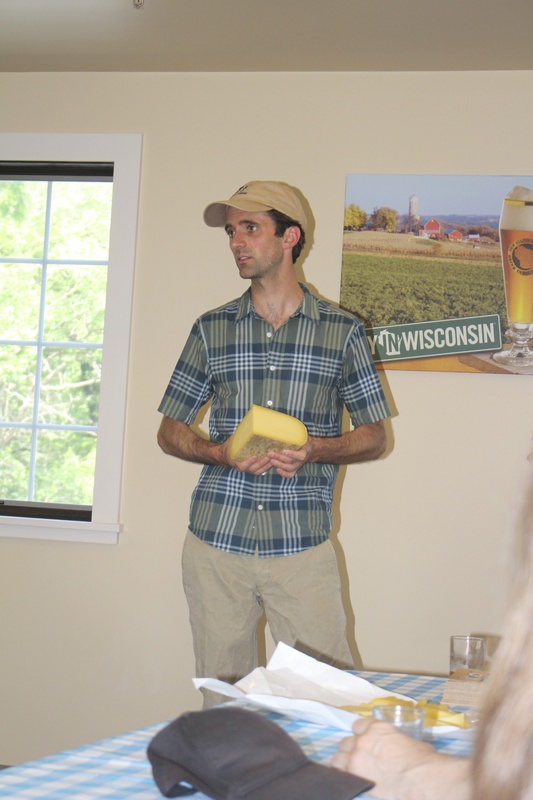 Uplands Cheese specializes in making their cheese “seasonally” in a true Alpine Style. The cultured milk has to be held at a certain temperature for a specific period of time to ripen. (Or for if it helps the at home bread makers understand better…to proof.) The bacterium grows during this time and the pH lowers slightly. But Barb…when does it become cheese?? Where does the whey come in?? 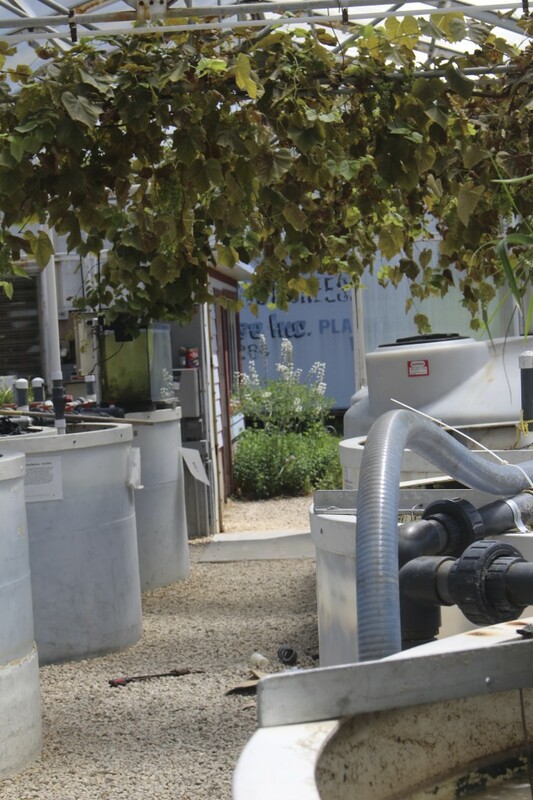 Cheers to Cedar Grove and their “Living Machine.” It uses natural microbes and a collection of hydroponic plants to clean their water before it is reintroduced into the ground. What is left is sort of a slab o’ cheese. The process continues as different handling techniques are applied and the desired pH is achieved. The mats are cut into smaller pieces (like the World’s biggest cheese grater) and then some real expertise is put into action. 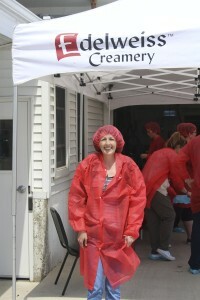 Thank you, Cedar Grove Cheese for the great behind the scenes tour! 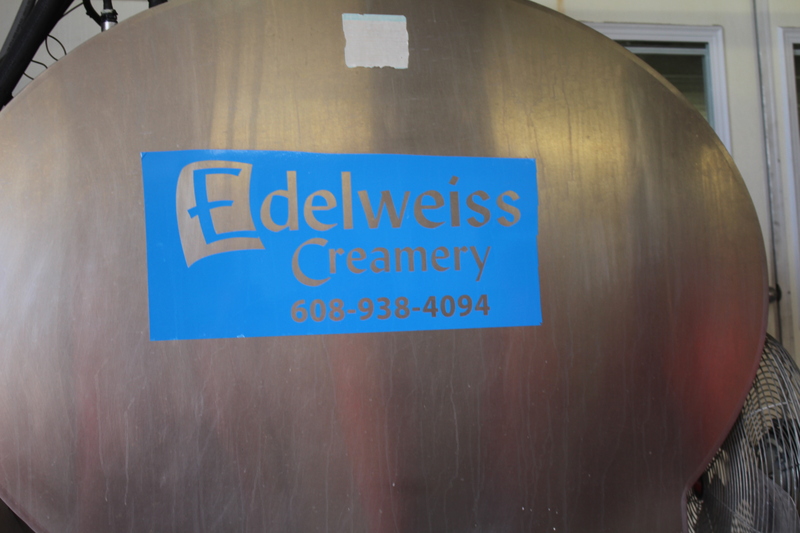 Butterkase being washed in a saltwater solution at Edeelweiss. 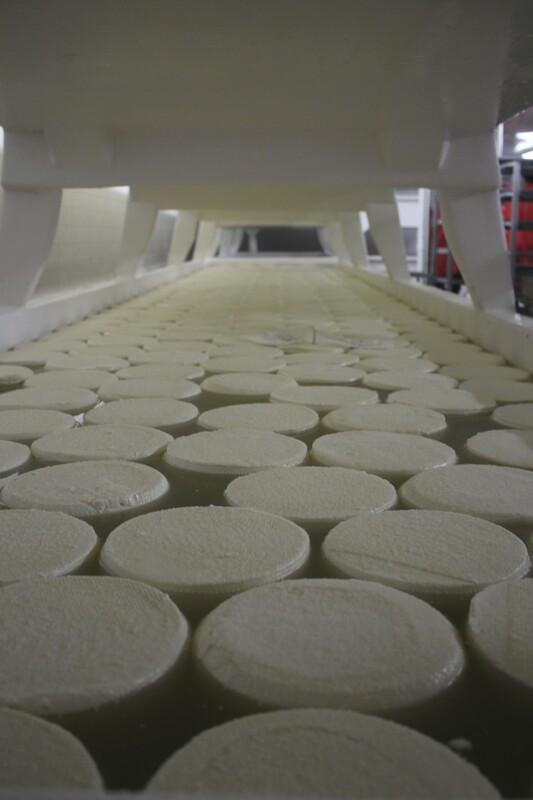 As the smaller pieces are placed into molds, more whey is pushed out and the curds intertwine into each other to form whatever shape is desired. Cheese makers can also add salt before they are placed in the mold or in some cases the cheese is washed in a brine (salt water) solution. The formed cheese is then stored in coolers or caves and aged. 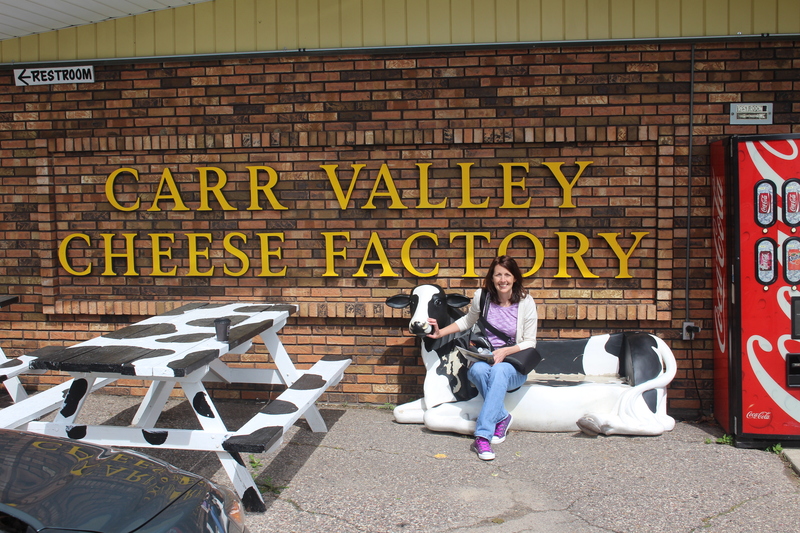 (If I had a “moo”illion dollars, I’d have a cheese cave.) 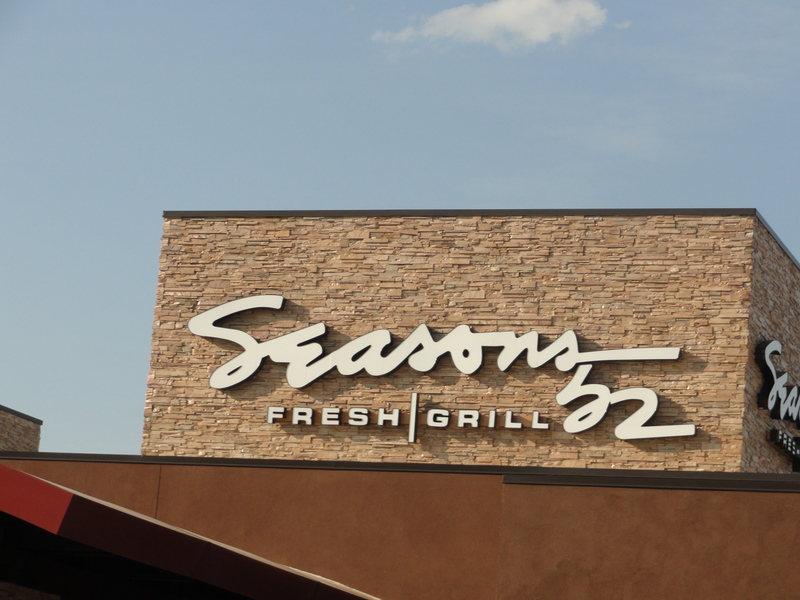 The age of the cheese is a HUGE determinant in how that cheese will taste and the texture. Thank you to Edelweiss Cheese, Roelli Cheese, Hook’s Cheese, Carr Valley Cheese, Uplands Cheese and Cedar Grove Cheese for tea”cheese”ing me so much!!! It’s always so much fun to live vicariously through your adventures and this one is really fun. One of my favorite things is to go to the farmers market on Saturday mornings and sample and buy cheese to enjoy later in the day or week. Can’t wait for the next installment. Glad you got to go on this adventure and happy to tag along for the ride! I ran into this page accidentally, surprisingly, this is a amazing blog :-). The site owner has carried out a superb job of putting it together, the info here is really insightful. You just secured yourself a guarenteed reader.